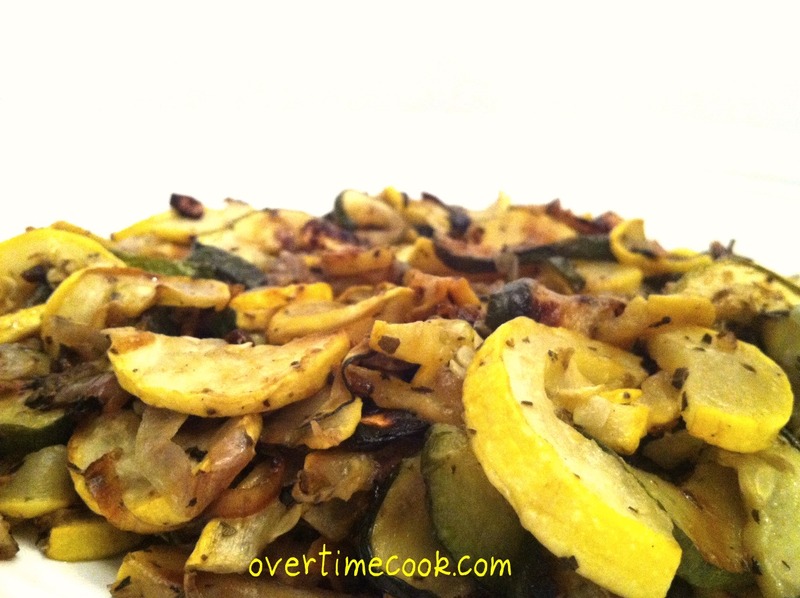 So it turns out this Overtime Cook idea is harder than it sounds. Does it sound hard? It’s harder. I get home at about 7:30 pm on a good night. By the time I cook and eat supper and start my baking, it’s late. I finish at a ridiculous hour, then try to photograph my food, clean up, shower and get a few minutes of sleep before I wake up at 6:30 the next morning for another round of this. Whew. Just typing my schedule is getting me tired. Time for another super easy recipe, don’t you think? Let’s talk squash. Zucchini, to be precise. I’m pretty sure zucchini is my all time favorite vegetable. I love it’s versatility; one vegetable can turn into a delicious side dish off the grill, a breaded stick to rival French fries, and a lovely muffin! 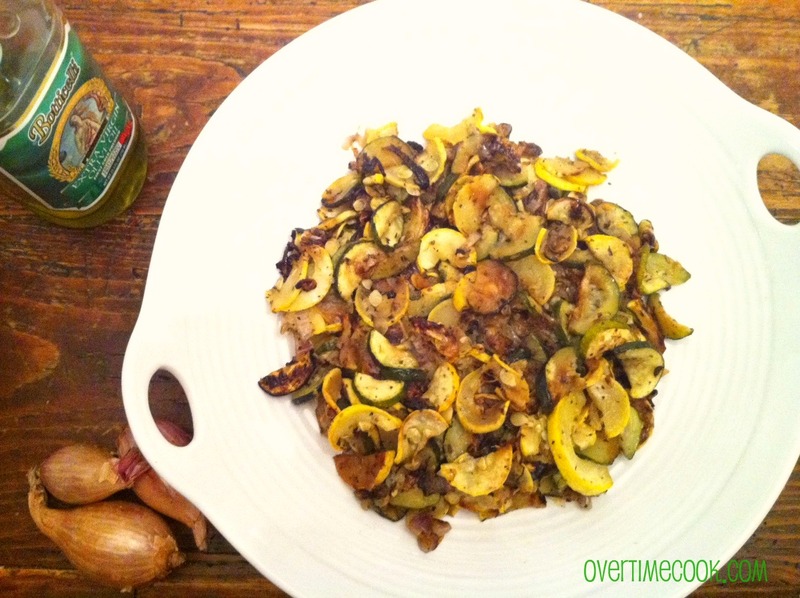 I always have zucchini on hand, and when I’m pressed for time and need a good veggie dish, this is my go to recipe. If you don’t have yellow squash, feel free to use all zucchini- you’ll miss out on the pretty colors though. Preheat oven to 450. Line baking sheet with parchment paper. Cut half rings of the two kinds of squash and place in large mixing bowl. Dice the shallots and add to bowl. Mix together oil, salt, pepper and herbs. Toss oil mixture with veggies to coat evenly. Spread on prepared baking sheet in roughly a single layer. Bake for 15 minutes, then stir and return to oven. Bake additional 10-15 minutes, or until it reaches your desired level of doneness. Serve hot, preferably, but I often eat this cold and it’s delicious that way too! Looks yummy. I love simple dishes that highlight veggies as the star. Thanks for stopping by and visiting! Veggies are my favorite- I am always looking for new ways to cook veggies, but this is my go-to recipe! This is so good, and healthy! Thanks for helping me keep my diet going by posting delicious recipes that don’t taste bland! Thank you!! I always need new vegetable side dishes and look forward to trying this one. I recently made your broccoli and carrot ginger soup recipes, they were great! Thank you! This recipe was so delicious and easy to make! Will definitely be a new favorite.